The Coslys Organic Extra-Rich Body Cream is a moisturizing balm that takes care of all skin types! Rich in organic sweet almond and arnica extract, it moisturizes and nourishes the skin intensely while preventing skin dryness. It protects the skin from external aggressions such as cold and preserves its elasticity. Your skin regains its flexibility and comfort. Comforting, its gourmet perfume with notes of vanilla and apricot and its non-greasy creamy texture make you have a real cocooning moment. It penetrates quickly and soothes the skin immediately. 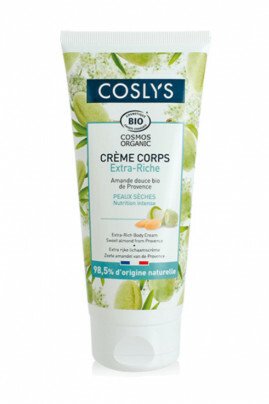 Coslys Organic Extra-Rich Body Cream is the ally of dry skin! A hydrated, soft skin that regains its flexibility! On clean, dry skin, apply extra-rich cream to your entire body. You can use it daily and as soon as you feel the need. In the evening, generously apply the cream on your feet and then put on your socks to nourish the skin intensely. Coslys Organic Body Cream is a care rich in natural ingredients!